Ongoing evolution of new designer drugs, also known as new psychoactive substances (NPS), requires continuous updating of screening methods when determining the suspected role of NPS in deaths. The open library concept of the Toxtyper system allows for rapid updates of methods linked to the appearance of new drugs. The following application note describes the development and validation of a sensitive screening method for the identification of the common prescription analgesics (e.g. oxycodone, methadone and buprenorphine) together with illicit substances such as fentanyl, beta-Hydroxythiofentanyl and other fentanyl analogs with detection limits in sub-ppb to low ppb range. 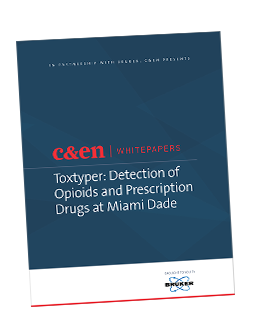 Learn how to develop a sensitive screening method for the identification of common prescription analgesics and illicit substances such as fentanyl and other fentanyl derivatives. Learn how to modify LC and MS conditions to optimize your protocol. See examples of how to screen for 30 prescription drugs simultaneously. Have a better understanding how whole blood samples can affect the limit of detection.